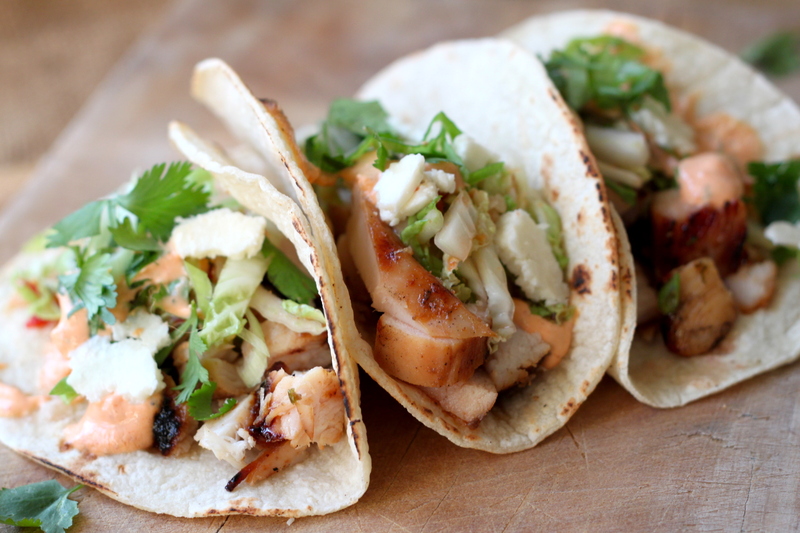 These taco’s came about quite literally by impulse and a well stocked pantry. I had some chicken marinating in a mixture of soy and fish sauce (and a bunch of other things, full recipe below) that I was going to grill for dinner last night alongside a quick salad. That was the plan. However, I remembered that I had some corn tortillas somewhere and that kicked off a flurry of activity in my mind and hence these Korean Taco’s were born. 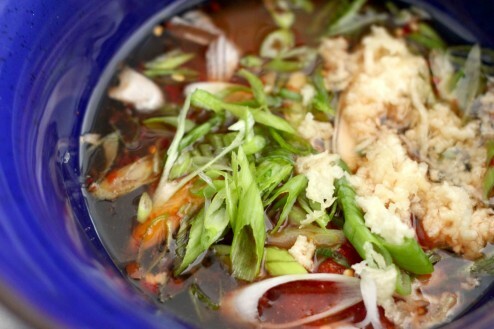 Blending two cultures food style and flavors are by no means a new thing. For those who follow Chef Roy Choi and his amazing iconic Kogi Trucks here in Los Angeles you know this to be true. They do it perfectly, way better than me. 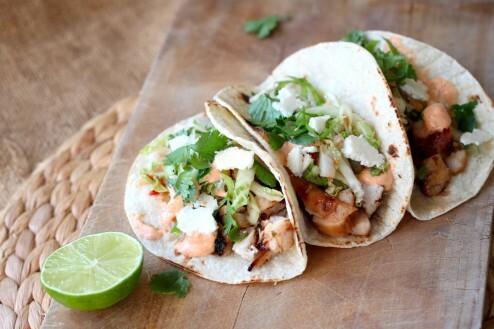 I’m calling them Korean tacos mainly because of the kimchi but we are using products from many different Asian countries – sriracha from Thailand, garlic chili paste from Vietnam and so on. Globalization may actually be a good thing. So, with all that said, very rarely do I impress myself but these were pretty darn delicious. You should make them. Today. Now. 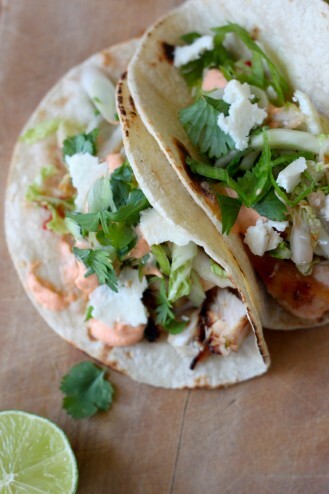 These taco’s came about quite literally by impulse and a well stocked pantry. I had some chicken marinating in a mixture of soy and fish sauce (and a bunch of other things, full recipe below) that I was going to grill for dinner last night alongside a quick salad. That was the plan. However, I remembered that I had some corn tortillas somewhere and that kicked off a flurry of activity in my mind and hence these Korean Taco’s were born. Blending two cultures food style and flavors are by no means a new thing. For those who follow Chef Roy Choi and his amazing iconic Kogi Trucks here in Los Angeles you know this to be true. They do it perfectly, way better than me. I’m calling them Korean tacos mainly because of the kimchi but we are using products from many different Asian countries - siracha from Thailand, garlic chili paste from Vietnam and so on. Globalization may actually be a good thing. So, with all that said, very rarely do I impress myself but these were pretty darn delicious. You should make them. Today. Now. 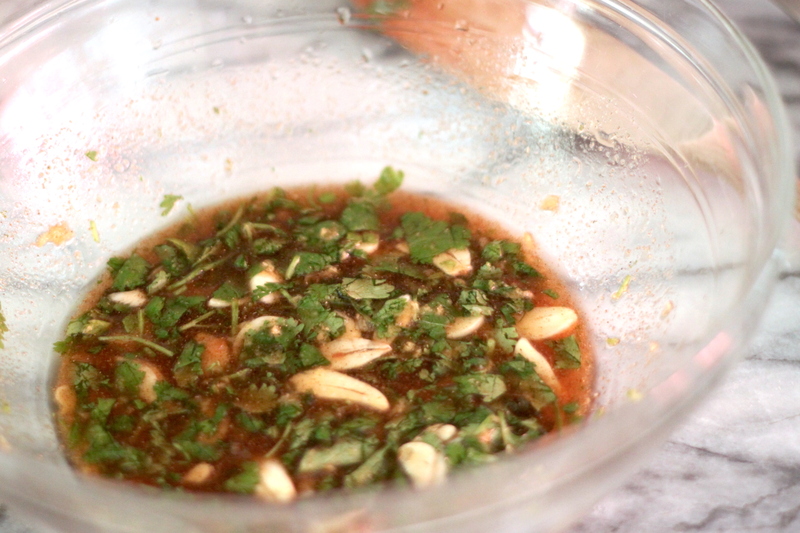 In a large bowl, mix all the chicken marinade ingredients together and add chicken, toss to coat. Cover with plastic wrap and let marinate in the refrigerator for at least 2 hours or overnight. Meanwhile, in a small bowl mix all the ingredients for the Sriracha Crema, cover and let chill until ready to serve. 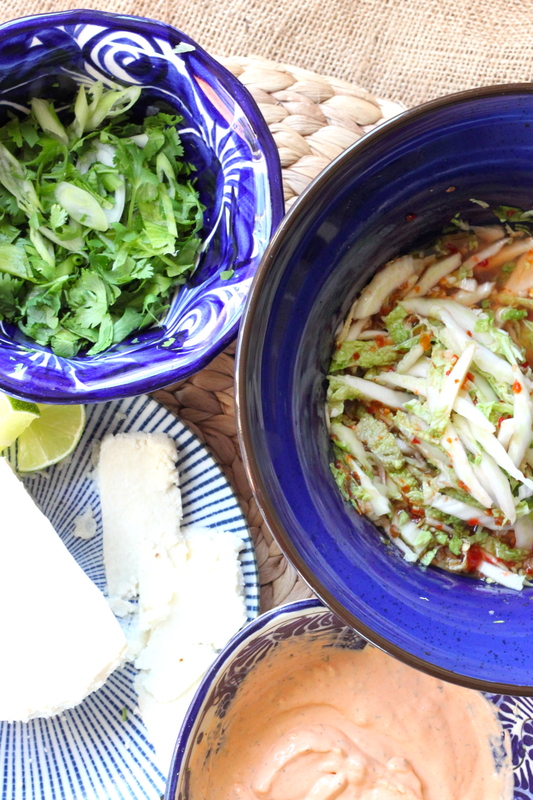 For the quick Kimchi Slaw, add the chili garlic paste, fish sauce, white vinegar, rice vinegar, sugar, garlic and green onion together in a medium bowl. 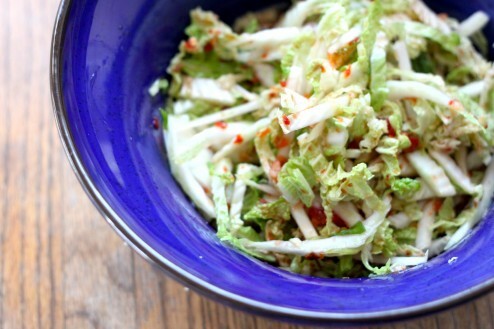 Add the Napa cabbage and toss to coat. Cover and chill until ready to serve. Before lighting the grill, let the chicken sit out at room temperature for 30 minutes. 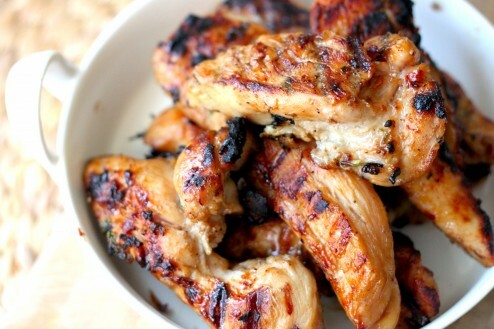 Over medium high coals or flame, grill chicken for 8 - 10 minutes on each side or until cooked through. Remove from flames and let rest for 10 minutes, covered in a draft free place. On a cutting board, roughly chop chicken into small pieces and put in a serving dish. While chicken is grilling, set out the Kimchi Slaw and Sriracha Crema in a serving bowl. Mix cilantro and scallions in a small serving bowl, crumble Cotija cheese and set our lime wedges. After chopping the chicken up, heat corn tortillas on the grill until warm and slightly crispy on the outside. 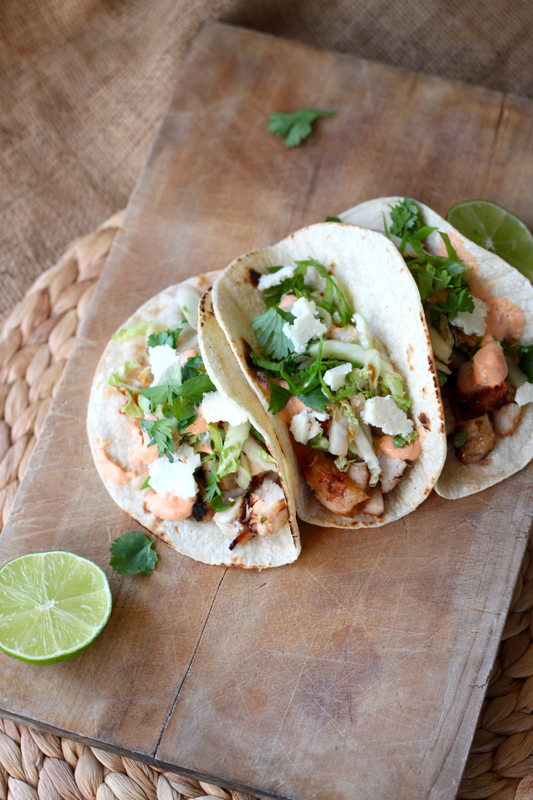 Set on a serving platter and serve immediately, letting guests assemble their own tacos. I saw this this afternoon while watching, off and on, my daughter’s karate practice. I knew I had to have this for dinner.I was only missing a couple of ingredients, chicken, limes, and cilantro; so a quick stop of my local market and off to the house. It was delicious, colorful, and gluten free. My husband and daughter want this as a keeper in my cookb0k. Thank you so much, from all of us. Audrey! I’m so glad that it was a huge hit with your family – makes me very happy! Thanks for taking the time to let me know!